OWA is the guarantee of a reduction of your environmental footprint thanks to a process of valorization of the lifecycle of the certified and guaranteed product. A perfect example of a circular economy. With the OWA offer, enter in the heart of a new consumption model where no waste is produced. Preserve natural resources and anticipate products’ recycling are two fundamental principles of the circular economy in which OWA is part. Everything has been thought responsibly, from eco-designed and recyclable packaging to the recovery of cartridges collected in the form of remanufactured cartridges or secondary raw materials. • More than 75% of used cartridge components are reused. The last is recycled into secondary raw materials. • Environmental impact half reduced for large capacity cartridges (compared to their standard equivalent). • Eco-designed, recyclable and reusable packaging made from recycled materials and FSC certified. At ARMOR, quality is respected at all levels throughout the life cycle of the product. In that respect, the entire range of OWA Laser cartridges is QUALICERT certified (collection, sorting and recovery, remanufacturing and distribution). 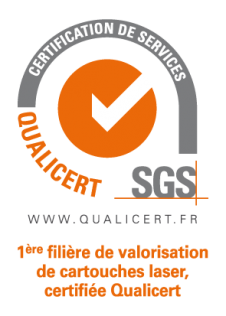 ARMOR is the only market player to benefit from this label, awarded by SGS ICS, the world leader in certification, accredited by COFRAC (French Accreditation Committee). QUALICERT certifies that ARMOR respects its commitments of quality and recovery at 100%.